The surrounding scenery of Vivanta by Taj Madikeri is enchanting enough for the tourists to get charmed and opt for a stay in it. Covering an area of 180 acres of verdant rainforest, this luxury property is placed at an altitude of 4000 feet and is nestled in hill ranges. Opt for special Ayuerveda massages, therapies and treatments, prepared by the professional experts at the Jiva Grande Spa, which spreads itself in 30,000 sq ft of an area. 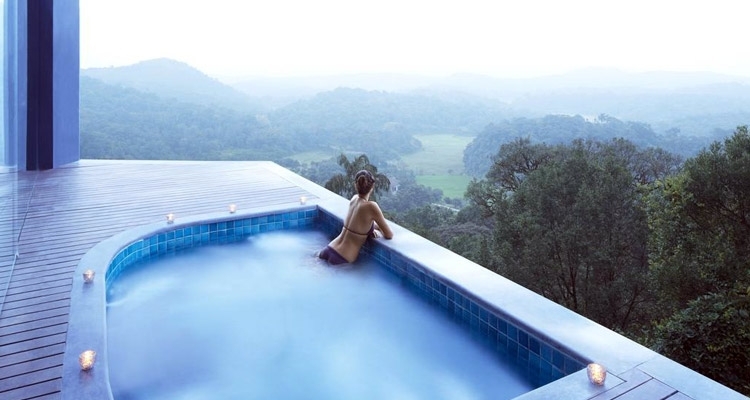 Opt for a stay in Coorg-style villas and rooms, filled with all modern luxuries. Have a relaxing and rejuvenating vacation. Spread in 180 acres of living rainforest, Vivanta by Taj Madikeri is located at an altitude of 4000 feet amidst lush hill ranges. 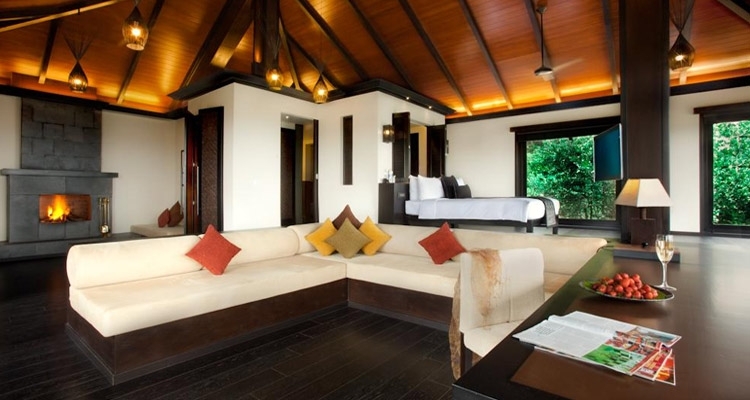 The luxury rooms and villas have interiors and exteriors inspired from Coorg-styled houses. 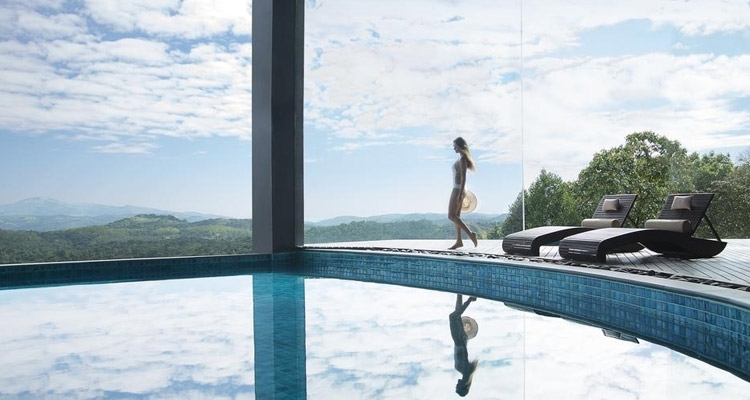 This luxury property is quite popular for its Jiva Grande Spa, spread in 30,000 sq ft of an area. Treat your eyes to the green forests and hills spread around with over 250 species of flora, natural springs, canopied woods and more. Indulge in luxurious living and the best of Ayurveda experience. The main railhead near Madikeri is in Mangalore, which is well-connected through regular trains with all the main destinations in India. The other nearest railway stations to Madikeri are Kannaur, Hassan, Kasargod and Thalassery. Each of the railway station is around 115 km away from here. The nearest airport is the Mangalore terminal that is around 143 km away that is connected to 2 popular south Indian cities, Chennai and Bangalore. Once at the airport, you can hire a taxi to the town, which may cost somewhere around 2500 INR. The nearest international airport is the Karipur airport (Kozhikode), around 180 km away. Ranted taxi may cost around 3,500 INR. This airport is connected to a number of Middle Eastern cities. The town of Madikeri is well- connected by state-run buses of Karnataka and Kerala. Along with this, you can also opt for private buses as well that connect the town to other nearby cities. The Jiva Grande Spa offers the best of relaxation therapies that are a perfect blend of ancient Ayuervedic rituals and modern therapy. Guests are offered an ethereal experience through age-old treatments, aromatic massage and indigenous scrubs and wraps. 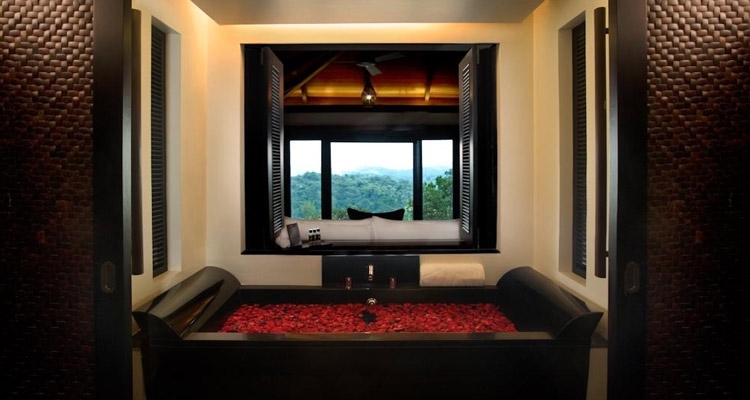 Covering an area of 30,000 sq ft of an area, this spa includes a relaxation deck, an open-air and a climate-controlled indoor swimming pool, a wellness café, 8 private treatment rooms with their own showers and steam and a special Coorg experience - Gudda bath (wood-fired bath in an outdoor pavilion). All the Signature treatments, have been particularly created for the spa, mainly on the lines of ancient remedies and regal traditions. India, as a destination has always been known for offering complete spiritual wellness. All the wellness therapies at the Jiva Spa are being practiced since ages. The scrubs and wraps at the Spa are prepared from natural ingredients such as pure essential oils, vegetables, fresh fruits, sea salts and Indian herbs. Indulge in exfoliating, nourishing and relaxing your body. All the products used in body treatment are especially made from natural ingredients. You can feel completely pampered by indulging in all the beauty rituals at the Jiva Grande Spa Madikeri. Ayurveda is the base of the wellness approach of the Jiva Spa, which works for the holistic health of an individual. The lifestyle which is promoted by Ayurveda is an amalgamation of physical and psychological well-being along with a satisfied soul. The expert therapist of the Spa prescribes a treatment as per an individual’s condition and requirement. Guests can indulge in exotic spa experiences for feeling pampered like royalty. At the spa, you can avail a host of wellness and beauty treatments. Open your eyes to the melodious chirping of the birds, treat your eyes to the lush scenic beauty, marvel at the view of the setting sun behind the canopies, during your stay at 63 luxury cottages, suites, villas and rooms. All the luxurious room types have been made from eco-friendly materials. The colour palette includes muted colours and there is use of re-cycled woods, mud paints, displaced soil, natural river stones and tiles. Have a comfortable stay amidst all contemporary services and amenities while staying in this luxurious space of 850 sq. feet. The panoramic windows offer mesmerizing views of the verdant green valley and the rainforest. A typical Coorg house is the inspiration behind the décor of these rooms. Covering an area of 1000 sq. feet, this room come with a fireplace and all kinds of contemporary facilities. The spacious attached bathrooms come with chic stone cladding, rain shower and a bathtub. The décor has been inspired from a typical Coorg house. The walls are adorned with oil paintings. Get drenched in ultimate luxury and modern comforts while staying these villas, which have been spread in an area of 3300 sq ft of land. This villa has a 4 feet deep plunge pool and a balcony for some great views. Some of the common facilities include international direct dial facility, mini-bar, tea/coffee maker, 24-hour room service, television with satellite programmes, a state of the art intelligent home panel system, availability of smoking/non-smoking rooms and more. As You Like It! 101 Candles At The Amphitheatre: Just the right place for a dinner date, with the table being set in an outdoor area, offering the view of the rainforest. Enjoy a 7-course meal accompanied by the finest of wines. The Nook Dining Experience At The Buddha Garden: Relish sumptuous food during a 5-course meal, where the path leading to the table has been lit-up with candles, placed in silver holders. Savour glasses of wines. Chef’s Table: Enjoy cooking in the company of the Chef, wherein you can prepare your own meal. At this all-day multi-cuisine restaurant, relish sumptuous meals including delicacies of Far Eastern, Continental and traditional South Indian fares. You have the option of enjoying your meals indoor as well as outdoors. Prawns in chillies and basil, Wine poached pears salad,tamarind and strawberry homemade ice creams and House special roast chicken are some of the signature dishes. Relish authentic Coorg dishes, prepared with pepper, Kachampuli, coconut, rice and bird chillies being the main ingredients. Chutneys made from coconut, gingelly seeds, horse gram and jack fruit seeds are the specialities. The expert chef has carved a special menu for the guests. Madhu Toppu Payasa, Pandi Kari, Yelel Chutta Meen and Kaad Mangae Kari are some of the signature dishes. Placed on the pool level, Dew serves dishes of wellness cuisine. You can indulge in eating without guilt. Dim sum, slow cooked fish, sorbet, thin crust no cheese pizzas are some of the signature dishes with a few ice creams, prepared with soy milk. While relishing grilled specialities, enjoy the cool breeze coming from the poolside and the grills. Enjoy a nice view of the paddy fields and lush plantations. Mixed grill with local spices, roasted wild mushroom and grilled vegetables grown property’s are some of the popular preparations. A well-stocked bar at the pool level, Hive bar is an amazing place to unwind and savour some exotic spirits,finest of wines and international spirits. There is also a spread of dishes and snacks to go with your drinks. Relax yourself while some great music is being played. Salamander, Curry leaf mojito, Strawberry & Basil Martini, Chilli-Chilli-tini are some of the signature cocktails in this bar.